eTrafficNetwork.com- FREE web site traffic marketing & promotion tools, tips, & services! Select one of our FREE website marketing and promotion services TODAY! One of the fastest and easiest ways to build traffic to your website. Our FREE AUTO SURF NETWORK delivers thousands of visitors to websites every day. 200 FREE credits at sign up! Check out our 4 to 3 FREE POPUNDER EXCHANGE with full size window and one pop per visitor technology. Plus, our exchanges are linked for maximum search engine spidering! Join our network and more spiderbots will visit your site daily, and your search engine ranking will skyrocket! 100 FREE credits at sign up! Banner advertising still works great. And with our BANNER EXCHANGE, it's 100% FREE! Banners included in our exchange also circulate throughout our entire network, which is constantly hit by search engine spiderbots! 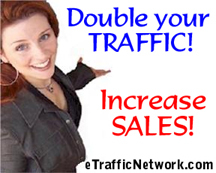 E Traffic Network sells targeted EXPIRED DOMAIN TRAFFIC at wholesale prices! Targeted expired domain traffic delivers REAL human eyeballs to your website. Targeted ADULT and CASINO traffic campaigns are also available! E Traffic Network also sells ADVERTISING SPACE at VERY low rates! In our continuing effort to help you improve the amount of traffic to your website we also have developed a very popular FREE RESOURCE CENTER filled with ebooks, traffic networks, banner exchanges and more. Sign up for 86,804 FREE visitors to your website, and counting! JOIN TODAY! Click here to BUY TRAFFIC and ADVERTISING! E Traffic Network is TOP RATED! Check out our Alexa ranking HERE! TRADE hits with us and GROW with us! Why mess with the "little guys"? Click on the links below to visit our other sites!